The term laser is an acronym for the “light amplification by stimulated emission of radiation” and laser is a light beam emitted from a device through a method of optical amplification based on the stimulated emission of electromagnetic waves. Surgical lasers use a beam to treat blood vessels that are bleeding or to remove diseased tissues. There are a number of different kinds of laser beams. Each one of them has a different color and use. The color of the light beam is related to the color of the tissue that is being treated and type of surgery that is being performed. Lasers can be used in almost every surgical procedure. In fact, general surgeons use various laser wavelengths and laser delivery systems to cut, vaporize, and remove tissue. The lasers are used for the different purposes such as to shrink or destroy tumors and lesions, to seal the blood vessels to reduce the blood loss, to remove moles, warts and tattoos and to decrease the appearance of the skin wrinkles. In fact, the lasers are used by the skilled and the trained surgeon for accomplishing the tasks related to the surgery that are complex and can be used to minimize the extent of the surgery and for achieving better outcomes in wound healing. Further, they are extremely useful in both open and laparoscopic procedures. Common surgical uses include breast surgery, removal of the gallbladder, hernia repair, solid organ surgery and treatment of pilonidal cyst. Moreover, generally three types of the lasers are used in the medical treatment. These include Carbon dioxide laser, Neodymium yttrium-aluminum-garnet laser and Argon Laser. The Carbon Dioxide laser is a device that coverts light energy to heat and the heat is then used for the purpose of minimizing the bleeding whereas Neodymium yttrium-aluminum-garnet laser enables the surgeons to see and touch the body parts that could otherwise be reached only through open surgery. Moreover, the Argon laser use light-sensitive dyes to shrink or dissolve tumors. The growth of the market is primarily driven by the rapid pace of the technology and the increasing number of chronic diseases across the globe. The increasing prevalence of the targeted diseases such as cancer and cardiovascular diseases and expanding base of patients suffering from ophthalmic disorder are the leading factors that has expanded the market to the global level. The growing preference for minimally invasive surgeries is also creating an up thrust in the global demand for surgical laser products. Moreover, the rising investments in the field from both public and private sectors are augmenting the market. Further, the advancements in the laser surgery, particularly the eye surgery have revolutionized the globe. Recently, the U.S. Food Drug and Administration has approved the technology that may change the way how the eye surgeons perform the operations. It is called Intra LASIK. The IntraLASIK procedure uses a precision laser device to create potentially a more precise flap without the use of a blade. Therefore, with the advantages the demand for the surgical operations through the laser has increased which has led to the expansion of the market. However, the market growth is hindered by the high procedural costs and limited medical reimbursements that act as a restraint to the market. Moreover, the safety concerns associated with the use of the surgical lasers also hamper the market growth. The carbon dioxide (CO2) based lasers are anticipated to be fastest growing segment in the surgical lasers market owing to the availability of advanced CO2surgical lasers. The laparoscopic surgery segment is expected to lead the surgical lasers market. The growth of this segment can be due to the growing awareness among patient, procedural benefits of this surgery and demand for minimally invasive procedures. The urology segment is projected to be fastest growing. The growth of this segment can be attributed to the increasing prevalence of urological disorders such as renal cancer, kidney stones and prostate enlargement. On the basis of the geography, North America holds the largest share of the market, followed by Europe. Increasing prevalence of chronic diseases, use of innovative surgical methods by the healthcare professionals, significant medical reimbursement policies and the large number of cosmetic laser equipment manufacturers are the major driving factors for the growth of surgical lasers market in this North America region. However, Asia-Pacific market is expected to be fastest growing surgical lasers market. 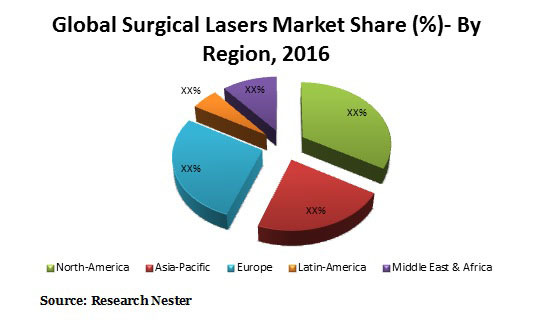 Factors such as the presence of a large patient population for target diseases and rising awareness among healthcare professionals regarding the benefits of surgical lasers are driving the growth of surgical lasers market in the region.